There seems to be a little issue happening in our courts. Court reporters are seeing a stenographer shortage coming in the very near future. So that does beg the question, is there a shortage of qualified Stenographers? We here at Courtscribes.com are here to find out. What is Stenography aka Shorthand? Shorthand is an abbreviated symbolic writing method that increases speed and brevity of writing as compared to longhand. Longhand is a more common method of writing a language. The process of writing in shorthand is called stenography. Traditional shorthand systems were written on paper with a stenographic pencil or pen. Machine shorthand is also a common term for writing produced by a stenotype, a specialized keyboard that are often used for courtroom transcripts. Learning stenography is like learning another language. The stenographic court reporting machine has 24 keys and works phonetically. Why is There a Shortage of Stenographers? To start awareness of the profession has steadily declined. A drop in enrollment has actually led to stenography schools closing. The industry’s focus is pushing young professionals into the job and supporting them through tough schooling. It does not help that television advertisements have become less common and schools that teach stenography have shuttered in recent years. The average age of a court reporter right now is 56 years old. The feeling is that many of these people are going to retire and by virtue of that fact, there will be a serious shortage of court reporters in the very near future. Stenographers provide transcripts for not only court proceedings, but also live captioning during cable broadcasts and college lectures, among other services. Did They See This Coming? The shortage of stenographers has been long anticipated. In 2013, the National Court Reporters Association commissioned an independent research group to study the industry and make predictions on its future demands. The drop in enrollment has led to schools closing, including two in the Central Florida area. Now, the only stenographic reporting programs in the state are in South Florida, though students can take classes online. Another problem is that student failure rates in these programs are high, and so is the cost of equipment and schooling. Stenography is a skill, much like learning piano. In some programs, only 4 percent of students who enter graduate. It can take between two and eight years to finish, and tuition can cost more than $10,000 per year. It is a lucrative career, and basically, a job is guaranteed upon completion of training. Recently graduated stenographers typically start with salaries in the low $40,000s, but can eventually make upward of $150,000. Since most stenographers are independent contractors, their income is based on how much work the reporter actually logs in. Like many trade occupations, automation has made its way into the industry. In court reporting, digital reporters have replaced stenographers for many routine legal proceedings. They set up microphones in a courtroom, then transcribe the recordings later. But their training is minimal. Minimal like only four weeks. 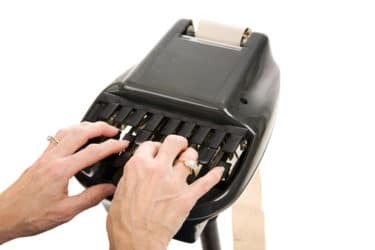 While digital reporters help by freeing up stenographers for more complex legal work, transcriptions can take three to five times longer for a digital reporter and often contain more errors. If courts continue to see a shortage in stenographers, forcing digital reporters to cover more high-profile proceedings, the quality of the record will deteriorate without a doubt. For example, occasional transcripts from digital reporters have come back indicating a word or sentence was inaudible, which doesn’t happen with stenographers. Since they are writing the record as it unfolds, they can ask someone to repeat a word, or move closer to their microphone. The National Court Reporters Association has a program called “A to Z,” which offers students free, six-week trial classes to test their interest in the profession. Students who decide to pursue the job can get tuition assistance and mentorship through Project Steno, which focuses on student outreach and enrollment. A program like this can only help what will become a dire situation unless it is addressed. If you ever need a stenographer, you can book one right now on our website courtscribes.com.